To get in touch with us please call or complete the simple contact form on the right. 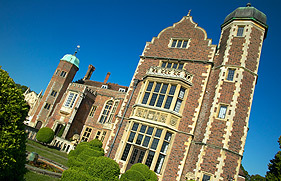 Located in the historic village of Madingley, just four miles west of Cambridge, Madingley Hall is easily accessible from the M11, A14 and A428, as well as Stansted, Heathrow, Luton and Gatwick airports. Our post code has recently changed, from CB3 8AQ to CB23 8AQ, which has caused problems with some GPS Tracking systems. If you are using GPS, please ensure that your final destination is Madingley.